North Adams was first settled in 1745 during  During the war, Canadians and Indians laid siege to Fort Massachusetts (located near the present-day Price Chopper Supermarket). 30 prisoners were taken to Quebec; half died in captivity. The town was incorporated separately from Adams in 1878. The city is named in honor of Samuel Adams, a leader in the American Revolution, signer of the Declaration of Independence, and governor of Massachusetts. For much of its history, North Adams was a mill town. Manufacturing began in the city before the Revolutionary War, largely because the confluence of the Hoosic River's two branches provided water power for small-scale industry. By the late 1700s and early 1800s, businesses included wholesale shoe manufacturers; a brick yard; a saw mill; cabinet-makers; hat manufacturers; machine shops for the construction of mill machines; marble works; wagon and sleigh-makers; and an ironworks, which provided the pig iron for armor plates on the Civil War ship, the Monitor. 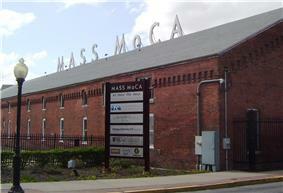 North Adams was also the headquarters for building the Hoosac Tunnel. In 1860, Oliver Arnold and Company was established with the latest equipment for printing cloth. Large government contracts to supply fabric for the Union Army helped the business prosper. During the next four decades, Arnold Print Works became one of the world's leading manufacturers of printed textiles. 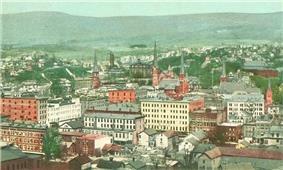 It also became the largest employer in North Adams, with some 3,200 workers by 1905. 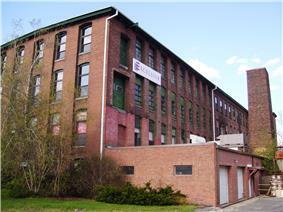 Despite decades of success, falling cloth prices and the lingering effects of the Great Depression forced the company to close its Marshall Street operation in 1942 and consolidated at smaller facilities in Adams. 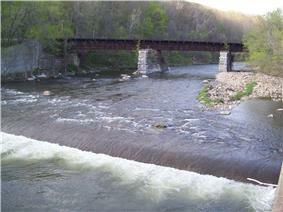 The Hoosic River runs through the city and was essential to its growth, providing power for the mills that were built along the banks of it and its branches. The city is the northern terminus of several lines of the Berkshire Regional Transit Authority and also has regional service. The freight rail line which passes through the city extends through the Hoosac Tunnel towards the east. North Adams is also home to Harriman-and-West Airport, a small regional airport. The nearest interstate highway is Interstate 91 to the east, almost an hour away, and the nearest airport with national service is Albany International Airport. In the city the population was spread out with 21.74% under the age of 18, 16.9% from 18 to 24, 21.4% from 25 to 44, 23.7% from 45 to 64, and 16.4% who were 65 years of age or older. The median age was 38 years. For every 100 females there were 91.2 males. For every 100 females age 18 and over, there were 89.75 males. 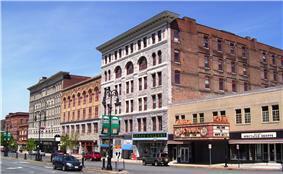 North Adams is governed by the mayor-council form of government (List of mayors of North Adams, Massachusetts). The city has its own services, including police, fire and public works. 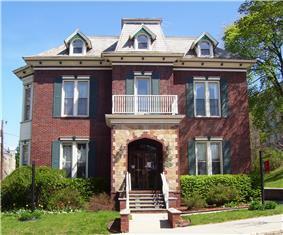 The city's public library is the largest in northern Berkshire County, and also has access to the regional library networks. 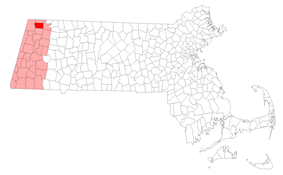 On the state level, North Adams is represented in the Massachusetts House of Representatives by the First Berkshire district, which covers northern Berkshire County, as well as portions of Franklin County. In the Massachusetts Senate, the city is represented by the Berkshire, Hampshire and Franklin district, which includes all of Berkshire County and western Hampshire and Franklin counties. The city is patrolled by the Fourth (Cheshire) Station of Barracks "B" of the Massachusetts State Police. 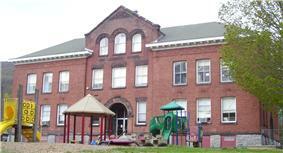 North Adams operates its own public school system, with three elementary schools (Brayton Elementary School, Greylock Elementary School and Sullivan Elementary School) and Drury High School, which also serves several neighboring towns. 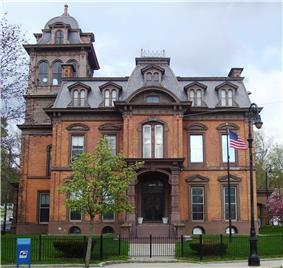 The city is also home to Charles H. McCann Technical High School, as well as several private and parochial schools. 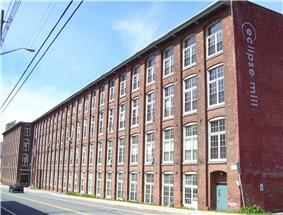 Due to North Adams being the location of MASS MoCA, there are numerous art galleries spread throughout the city, and some old mills have been converted to lofts for artists to live and work in. North Adams' first professional sports franchise is the Berkshire Battalion, an expansion team of the Federal Hockey League, which took the ice in the fall of 2014. There are many athletic complexes and recreational fields scattered throughout the city, including the Noel Field Athletic Complex, just south of the downtown, and the newly built Alcombright Athletic Complex, in the city's west end. ^ "Registered Voters and Party Enrollment as of February 15, 2012" (PDF). Massachusetts Elections Division. Retrieved 2014-07-22.